One of the great things about foam insulation is that it’s ideal for new and old homes! Learn about spray foam and the benefits of spray foam insulation here! 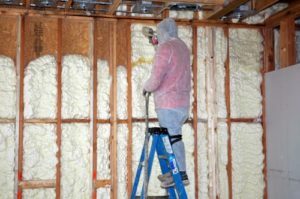 If you are looking to insulate a new building, or upgrade an older one, the benefits of spray foam insulation are worth looking into. Even though this type of insulation is more expensive than other types, the benefits of foam spray insulation can actually save you money on your bills. They are two different types of foam insulation.Depending on your needs, you can pick from the open cell and closed cell spray foam. Open-cell is the cheaper version, and it’s better at blocking noises, while a closed cell is dense, and it works better at keeping air and water from penetrating the walls. Open cell insulation tends to be more spongy, due to the air that gets inside the cells.Closed cell insulation is more rigid and solid. One of the biggest benefits of foam spray insulation is the sturdiness that it adds to the structure of the house.Due to the fact that foam fills the cracks, it protects the attic from water even if a storm rips off the roof. If you are interested in finding out more about the best type of insulation, take a look at our list of 8 benefits of spray foam insulation. One of the unique abilities of spray foams is getting into small cracks and crevices. Once the foam is applied directly into the cracks, it expands and dries quickly while blocking air and water. Foam insulation isn’t just a blockade for air and water, but for heat and cold as well. Depending on where you live, foam insulation can lower your heating and cooling bills. Even though foam insulation is more expensive than other types of insulation, it saves you money on bills in the long-term. Have you ever wondered how the new neighborhood will be? What if the neighbors aren’t a quiet, lovely couple in their 60s but instead young adults who party? Open cell spray foam has the ability to significantly reduce noise. The open cells inside the foam minimize more noise than other types of insulation. One of the benefits of spray foam insulation is reducing the amount of pollen, or allergens that get through the walls. Due to the fact that the foam reaches cracks and crevices, the air cannot penetrate the walls, as it does with other types of insulation. By reducing the number of allergens that get into the building, you help those who suffer from allergies or respiratory conditions.Less air getting in, fewer sneezes. Offices insulated with spray foam insulation make workers happier and more productive. Insulation inside your home can save you money on medical bills too. The tiny holes in your building structure are an open invitation to ants, bugs, and small rodents. Fortunately, the small cracks and crevices can be filled with spray foam. Closed cell spray foam is your best bet if you are looking to create a barrier against the tiny intruders. Once the spray foam gets into the small crevices, it gets hard. A hard barrier deters rodents, and the insects. By keeping away insects and rodents, you are also reducing the chances of getting sick from rodent waste. Both open cell and closed cell foam insulation prevent moisture from entering through the walls of your building. Even though both types of foam reduce the buildup of condensation, the closed cell spray foam works like a barrier against large quantities of water. The less water gets through your walls, the smaller the risk of developing health issues due to mold and mildew. Due to its density and hardness, closed cell insulation can actually strengthen the structure of your walls. Every building is built after a code that requires the walls to meet a minimum load bearing standard to hold the building together. However, the minimum standard doesn’t take mother nature into consideration. Strong winds, heavy snow, and earthquakes can be quite a challenge. One of the benefits of spray foam insulation is that it gets everywhere and it holds everything together as a strong glue. Insulating your attic with closed foam might save your roof during storms. The additional layer of protection to your walls can increase the value of your building. Fiberglass and Styrofoam insulation aren’t long-term solutions. Fiberglass sags and bunch, while Styrofoam breaks over the years. These types of insulation need to be replaced over time. On the other hand, spray foam insulation doesn’t sag or break over extended periods of time. Even though the initial investment is larger, spray foam saves you money in long-term. I have some good news for those who are concerned with keeping their households “green”. Spray foam reduces energy consumption and protects your building against mold and mildew growth. Since it’s longer lasting than any other type of insulation, it consumes less materials. The benefits of spray foam insulation should make everyone consider it, no matter if their building is new or old. Even though the initial investment is bigger than other types of insulation, it actually saves you money on your bills. During the winter, it protects your home from the cold and moisture. During the summer, it protects it from heat. It’s also a good option for those of us who value privacy. The open cell spray foam insulation blocks noise better than any other type of insulation. Your building structure will love it too. The closed cell type adds sturdiness to your walls and increases your building’s value. Additionally, it keeps you safe during strong winds, heavy snow, and earthquakes. If you want to insulate your building, in Houston, or ask any questions, feel free to contact us.